O God, whom to love above all is righteousness, multiply in us the gifts of Thine ineffable grace: and since Thou hast given us in the death of Thy Son to hope for those things which we believe, grant us by the Resurrection of the same to attain the end to which we aspire. 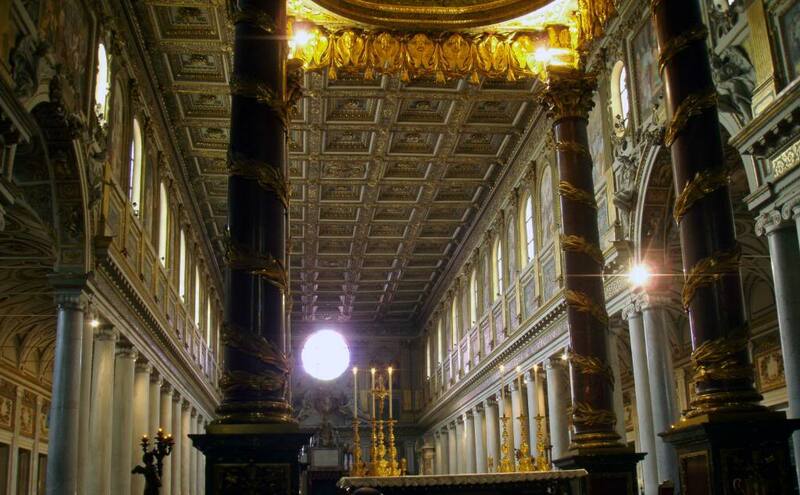 Just as Saint John Lateran was the station of the First Sunday of Lent, so it is fitting that the Cathedral Archbasilica is the station church which initiates Holy Week. It has been today’s station since the latter part of the fourth century. The blessing of the palms and the procession have always been distinct from the stational Mass. In years past, however, the two rites were held in the cathedral of Rome with all the magnificence of the pontifical court. Historically speaking, after Vespers today the Apostolic Major Penitentiary would sit on the cathedral throne. Then, as the penitents presented themselves before him, he would gently strike their heads with the virga (reed) as a sign of repentance. Through this act of the Church’s tribunal of mercy, those who were well-disposed (i.e. in a state of grace) were granted an indulgence. The baptistery received its present appearance under Urban VIII (1623-1644). Some of the decorations include the fine large frescoes along the interior walls; they represent the Apparition of the Cross to Constantine; the Battle of Ponte Milvio; and the triumph of Constantine; the burning of heretical books on the steps of the Lateran; and the destruction of the idols. The four chapels flanking the baptistery are exceptional. The first chapel on the right is that of St. John the Baptist with its fabulous “Singing Door” (not working in the wintertime). The second is the Chapel of Sts. Secunda and Rufina, occupying the original narthex. Notice its beautiful 4th century mosaic of acanthus leaves on a brilliant blue background. Ask to go through the door to see inside the grounds. The third chapel is that of St. Venantius with its 7th century mosaic, Michelangelo’s wooden ceiling, and the remains of the Roman mosaic pavement. Finally, the fourth chapel is that of St. John the Evangelist with its exquisite 5th century vault mosaic and its 12th century bronze door which once adorned the ancient residence of the popes.